Yet, as it does every year, it snuck up on me. 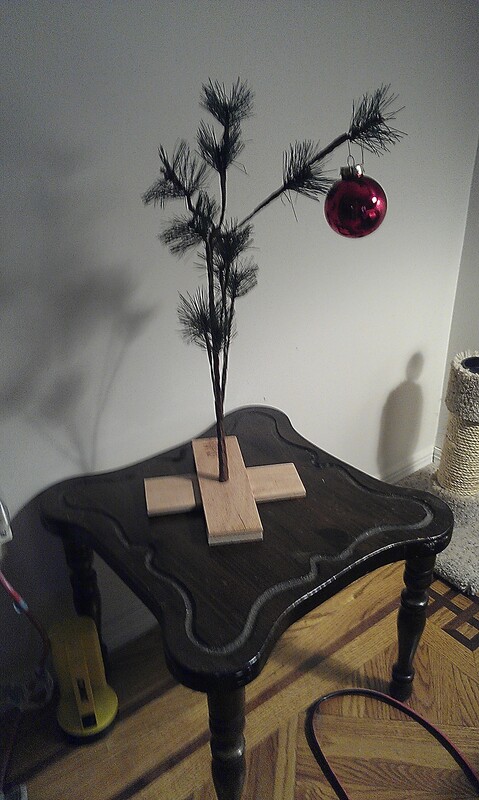 I put up my little Charlie Brown tree, managed to pull out a few festive items from the tremendous quantity of holiday hoo-hah (you know how much you accumulate over the years), and I came up with 2 gift ideas. And that’s pretty much it. One of my favorite things to do at the holidays is bake all kinds of delicious things: cakes, bread, candies, etc., so it’s disappointing that I will not have the opportunity to make all these things. There just isn’t enough time in the week. Right now, I’m taking some deep breaths and strategizing my time for the next week and a half. I wish I could pause the clock for a little while. But don’t we all? It’s coming up on a very busy time for many people. For us writers, it’s going to be a challenge getting that writing time in, especially if you have kids and/or many family responsibilities. My advice to you, as well as to myself, is to find one little hour during one day during the course of the week to be by yourself and write. Go down to the local coffee shop if you have to. It will make you feel better. Even if you don’t get another word written the rest of the week, you will know that you had that little bit of “me time.” It’s kind of like taking a nap—it’s not a full-night’s rest, but it’s enough to keep you going until you can go to sleep for the night. I’ve been taking my Netbook with me to bed because it’s the only place where I’ve been able to get any writing done. Of course, I don’t get very far before my eyelids become really heavy and I have to give up and shut everything down. But if I get a couple of paragraphs or a few lines of dialogue typed out, that’s a little more written than I had before. Eventually, it will add up. It’s hard to keep an even keel when you have so much going on, but I find that in the midst of chaos, if I just stop, breathe, and remind myself that getting crazy doesn’t make anything better or easier, I calm down.